1. 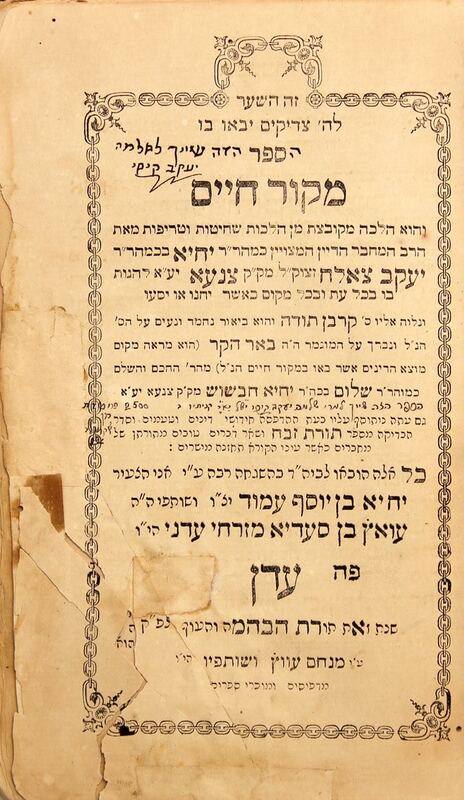 Mekor Chayim, halachot of shechita and treifut by Rav Yehi ben Rabbi Yaakov Tzalach, with a long exegesis called Korban Todah by Gaon Rav Shalom Chavshush, Aden 1893. Rare. 2. Petach HaOhel—dinei halachot of Gittin, by Rav Yehi ben Yosef Amud, with halachot of kiddushin and ketubot from the book Shoshanat HaMelech by Rav Shalom Chavshush of Sanaa. Aden, 1894. Printed by Menachem Avatz and partners, Aden. Half-leather binding. First page and the end of the book has a long note of ownership. Moth marks. Tears. Dark paper, dry. Stains. | , 137; , 63 pages. 20cm. Generally ok to good condition.